OpenCV library existing documentation has been converted to doxygen format. Please, check official download and installation pages. Some linux distributions can also provide doxygen packages. These instructions are specific to OpenCV library documentation, other projects can use different layout scheme and documenting agreements. source code entities, like classes, functions or enumerations, should be documented in corresponding header files, right prior entity definition. See examples in next sections. pages are good place to put big pieces of text with images and code examples not directly connected with any source code entity. Pages should be located in separate files and contained in several predefined places. This tutorial is example of such page. images can be used to illustrate described things. Usually located at the same places as pages, images can be inserted to any place of the documentation. code examples show how to use the library in real applications. Each sample is self-contained file which represents one simple application. Parts of these files can be included into documentation and tutorials to demonstrate function calls and objects collaboration. BibTeX references are used to create one common bibliography. All science books, articles and proceedings served as basis for library functionality should be put in this reference list. Automatic code parser looks for all header files (".h, .hpp" except for ".inl.hpp; .impl.hpp; _detail.hpp") in include folder and its subfolders. Some module-specific instructions (group definitions) and documentation should be put into "include/opencv2/<module-name>.hpp" file. You can put C++ template implementation and specialization to separate files (".impl.hpp") ignored by doxygen. Files in src subfolder are not parsed, because documentation is intended mostly for the library users, not developers. But it still is possible to generate full documentation by customizing processed files list in cmake script (doc/CMakeLists.txt) and doxygen options in its configuration file (doc/Doxyfile.in). /** @brief Calculates the exponent of every array element. double-precision input. Currently, the function converts denormalized values to zeros on output. Special values (NaN, Inf) are not handled. 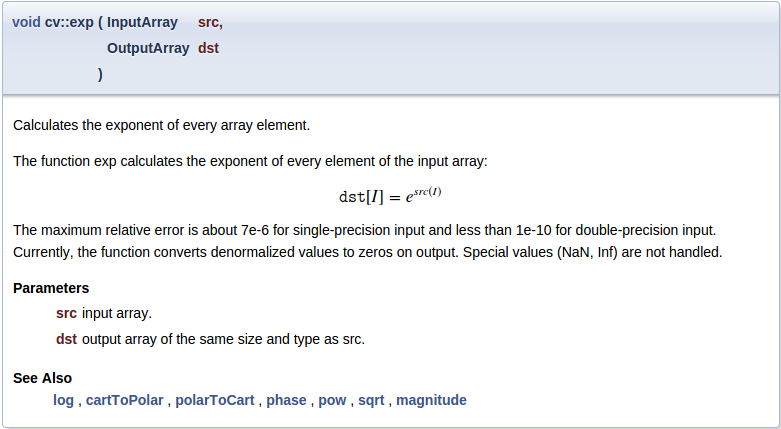 @param dst output array of the same size and type as src. command sa starts "See also" paragraph containing references to some classes, methods, pages or URLs. Doxygen supports Markdown formatting with some extensions. Short syntax reference is described below, for details visit Markdown support. You can assign a unique identifier to any header to reference it from other places. Most often used doxygen commands are described here with short examples. For the full list of available commands and detailed description, please visit Command reference. param - description of function argument. Multiple adjacent statements are merged into one list. If argument with this name is not found in actual function signature - doxygen warning will be produced. Function can have either no documented parameters, either all should be documented. note - visually highlighted "Note" paragraph. Multiple adjacent statements are merged into one block. overload - adds fixed text to the function description: "This is an overloaded member function, provided for convenience. It differs from the above function only in what argument(s) it accepts." anchor - places invisible named anchor, which can be referenced by ref command. It can be used in pages only. ref - explicit reference to a named section, page or anchor. If such entity can not be found - doxygen warning will be generated. This command has an optional argument - link text. Doxygen also generates some links automatically: if text contains word which can be found in documented entities - reference will be generated. This functionality can be disabled by prefixing the word with % symbol. Explicit named reference: @ref example_page "Example page"
To mark some text as a code in documentation, code and endcode commands are used. To include whole example file into documentation, include and includelineno commands are used. The file is searched in common samples locations, so you can specify just its name or short part of the path. The includelineno version also shows line numbers but prevents copy-pasting since the line numbers are included. If you want to include some parts of existing example file - use snippet command. Currently most of such partial inclusions are made with dontinclude command for compatibility with the old rST documentation. But newly created samples should be included with the snippet command, since this method is less affected by the changes in processed file. Toggle buttons are used to display the selected configuration (e.g. programming language, OS, IDE). To use the buttons in documentation, add_toggle and end_toggle commands are used. As you can see, the buttons are added automatically under the previous heading. All code entities should be put into named groups representing OpenCV modules and their internal structure, thus each module should be associated with a group with the same name. Good place to define groups and subgroups is the main header file for this module: "<module>/include/opencv2/<module>.hpp". Doxygen groups are called "modules" and are shown on "Modules" page. 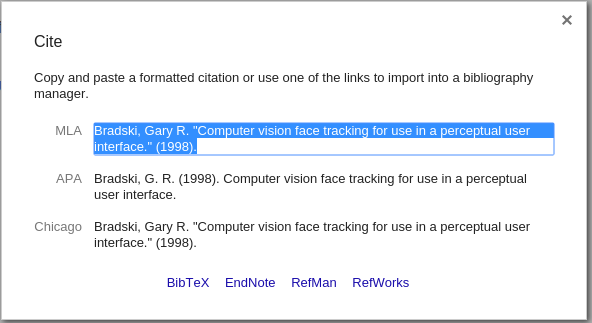 Use cite command to insert reference to related publications listed in Bibliography page. Try not to add publication duplicates because it can confuse documentation readers and writers later. Steps described in this section can be used as checklist during documentation writing. It is not necessary to do things in the same order, but some steps really depend on previous. And of course these steps are just basic guidelines, there is always a place for creativity. Add empty doxygen comment preceding function definition. Add brief command with short description of function meaning at the beginning. Add detailed description of the function. Optional: describe each parameter using the param command. Optional: describe return value of the function using the returns command. Optional: add bibliographic reference if any. Generate doxygen documentation and verify results. Formulate the idea to be illustrated in the tutorial. Make the example application, simple enough to be understood by a beginning developer. Be laconic and write descriptive comments, don't try to avoid every possible runtime error or to make universal utility. Your goal is to illustrate the idea. And it should fit one source file! If you want to insert code blocks from this file into your tutorial, mark them with special doxygen comments (see here). If you want to write the tutorial in more than one programming language, use the toggle buttons for alternative comments and code (see here). Collect results of the application work. It can be "before/after" images or some numbers representing performance or even a video. To save simple graph-like images use lossless ".png" format. For photo-like images - lossy ".jpg" format. Numbers will be inserted as plain text, possibly formatted as table. Video should be uploaded on YouTube. Create new tutorial page (".markdown"-file) in corresponding location (see here), and place all image files near it (or in "images" subdirectory). Also put your example application file and make sure it is compiled together with the OpenCV library when -DBUILD_EXAMPLES=ON option is enabled on cmake step. Add brief description of your idea and tutorial goals. Describe your program and/or its interesting pieces. Describe your results, insert previously added images or other results. Add bibliographic references if any (see here). Add newly created tutorial to the corresponding table of contents. Just find "table_of_content_*.markdown" file with the needed table and place new record in it similar to existing ones. You will learn how to visualize OpenCV matrices and images within Visual Studio 2012. As you can see it is just a list item with special subpage command which marks your page as a child and places it into the existing pages hierarchy. Add compatibility information, authors list and short description. Also note the list item indent, empty lines between paragraphs and special italic markers.